BLESSED IS HE WHO COMETH IN THE NAME OF THE LORD! 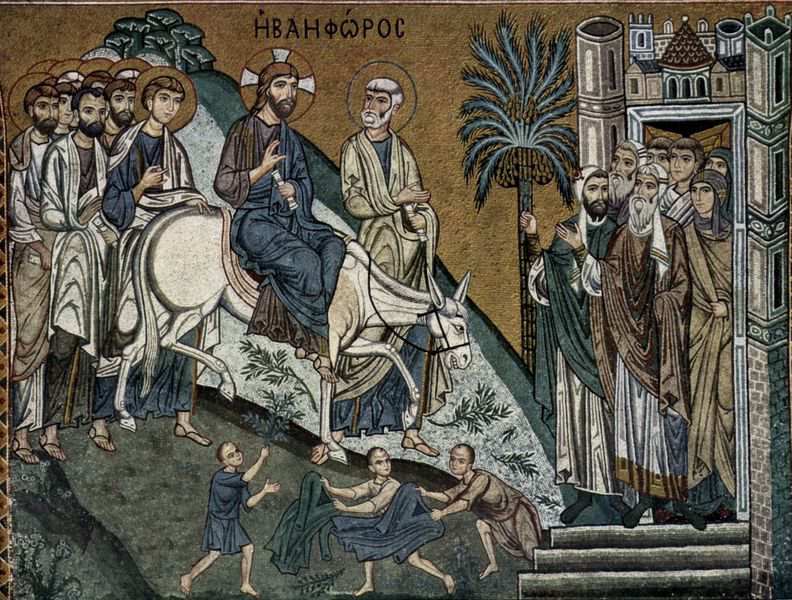 Entry into Jerusalem (Palm Sunday), 12th C. mosaic, Palermo Cathedral, Palermo, Sicily, Italy. Earlier this week I uploaded to Podcast Homilies page a new homily for Palm Sunday. Owing to space and time limitations, I did not comment on the Epistle reading for Palm Sunday. Palm Sunday is one of two days in the Church Year in which my homilies at my former parish of St. John Chrysostom and the AIC Podcast Homilies at the AIC web site do not use the appointed prayer book readings. That is because, for reasons beyond my comprehension, Archbishop Cranmer and other authors of the BCP chose to put the Gospel reading describing Jesus’ triumphal entry into Jerusalem on the First Sunday in Advent and not on Psalm Sunday. The Psalm Sunday reading, one of the longest if the prayer book, covers material that I use in homilies and readings for Maundy Thursday and Good Friday. For the Podcast Homily series I have used a combination of the four Gospel accounts on the entry into Jerusalem, pointing out the differences between what Sts. Matthew, Mark, Luke and John wrote. Not using these readings on Palms Sunday, it seems to me, deprives the laity of the Church of a contextual narrative of what led to the terrible events of Holy Week. While the Podcast Homilies, being audio files, cannot have pictures, I have provided here three illustrations of the Entry into Jerusalem from the 12th, 15th and 19th Centuries. 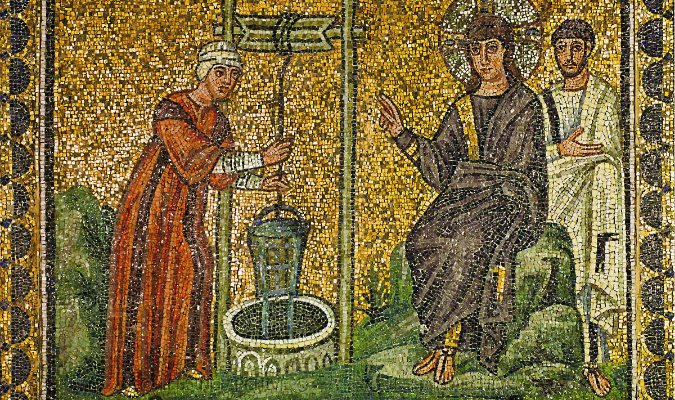 The first illustration (above) is a 12th Century mosaic at Palermo Cathedral, Palermo, Sicity, Italy, in the Byzantine style still common in Italy at that time. 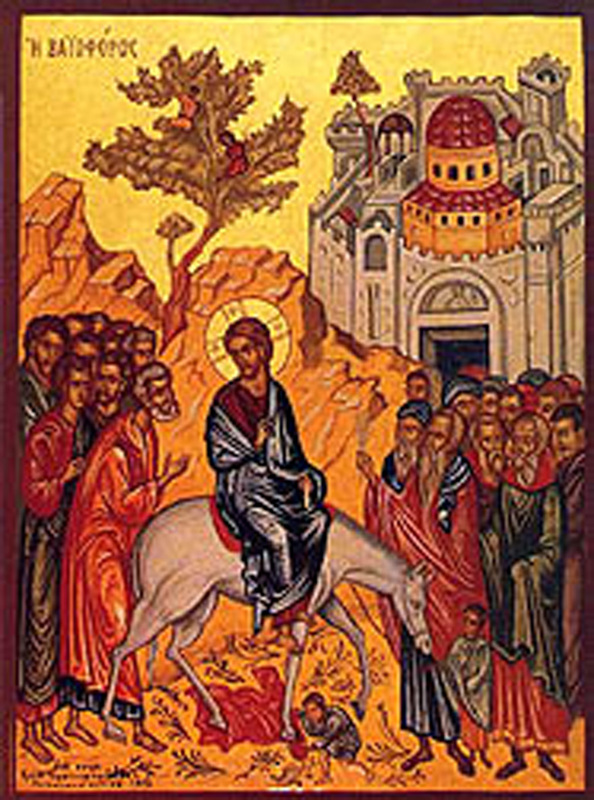 Jesus is shown riding the donkey sidesaddle, which is a royal style and which is still preferred in Eastern Orthodox Church art works. Palm Sunday re-enactment of the Triumphal Entry into Jerusalem, mid-19th Century, Red Square in front of the Kremlin, Moscow, Russia. Oil on canvas, Vyacheslav Grigorivich Schwarz. cases, Jesus is at the center of the image. The final illustration (left) is an oil on canvas by Russian historical painter Vyacheslav Grigorivich Schwartz showing a symbolic procession imitating the Triumphal Entry reenacted in Red Square in front of the Kremlin in the mid-19th Century. Blessed is the King who comes in the name of the Lord. Peace in heaven and glory in the Highest (Luke 19:38). Thou didst confirm the universal Resurrection, O Christ our God! Hosanna in the Highest! Blessed is He that cometh in the Name of the Lord! Amen. ALMIGHTY and everlasting God, who, of thy tender love towards mankind, hast sent Thy Son, our Saviour Jesus Christ, to take upon Him our flesh, and to suffer death upon the Cross, that all mankind should follow the example of His great humility; Mercifully grant, that we may both follow the example of His patience, and also be made partakers of His Resurrection; through Jesus Christ our Lord. Amen. I continue to produce Podcast Homilies tied to the Epistle and Gospel readings in the 1928 Book of Common Prayer. The Homily for Fifth Sunday in Lent (Passion Sunday) was uploaded on Thursday morning. The two readings are Hebrews 9:11-15 and John 8:46-59. 18th Century Russian Orthodox icon of Christ patterned after the original from Edessa, Syria. The Gospel reading is part of St. John’s account of the running controversy between Jesus and the Pharisees which takes up much of Chapters 6, 7, 8 & 9. The highlights are the accusation that the “father’ of these Pharisees was not the patriarch Abraham but the devil and the climactic I Am declaration in verse 58: Before Abraham was, I Am. In Greek this is ego eimi, which is the equivalent of God’s declaration of His identity to Abraham in Exodus. Many modern translations deny the I Am identification. In New Testament: Gospels & Epistles is take up Episodes Twenty-nine to Thirty-five with a discussion of 12 examples of the unique I Am declarations, the first to the Samaritan Woman at the Well and the Last the I Am the True Vine. Also this morning I uploaded Episode Forty-one in the New Testament series, focused on St. John’s illustration, in the words of Jesus, of the relationship between God the Father and God the Son and St. John’s unique mention of Places and People, including Samaria and Cana. the Samaritan Woman at the Well, Nathaniel, Thomas, Philip and Andrew. In the next episode I will continue the unique references to people with Peter, Nicodemus, Judas and Mary Magdalene. With the coming of a hint of Spring and my wife’s continuing recovery from her accident, I took down the temporary handicapped ramp I built in early January. This presented the opportunity to do some landscape work, which I will continue doing this morning (at least until the predicted rainfall begins). Episode 41 and part of Episode 42 in the New Testament series is complete but they will not be uploaded until some time this coming week. I need to do so further editing of the scripts and, possibly, production of one more slide for Episode 41. Today’s three illustrations are part of those used for the Bible Study series which touched upon the Feeding of the 5,000. 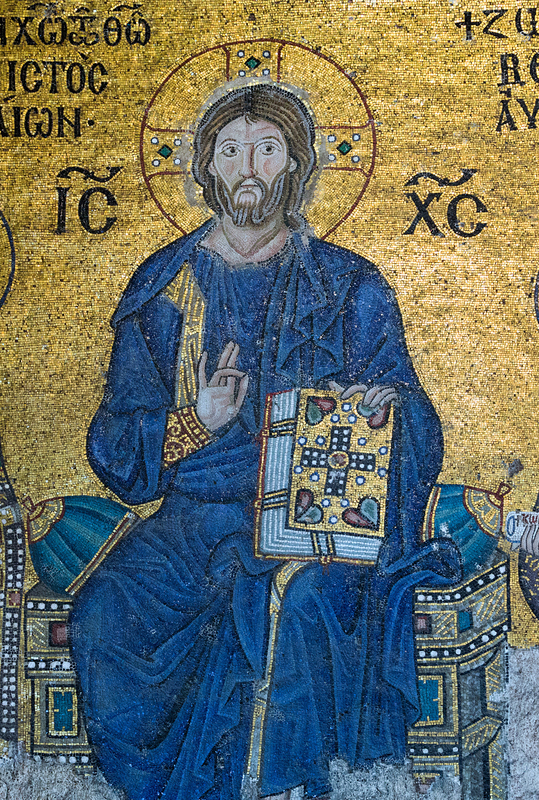 I cropped the center detail of a larger mosaic of Christ flanked by a Byzantine Emperor and Empress. The Hagia Sophia is a true treasure house of Christian art from the early Church. Later converted into a mosque and even later into a museum, the Moslems attempted to destroy many of the images so that most of what is left was too far off the ground for the vandals to reach them and pray them off or paint over them. 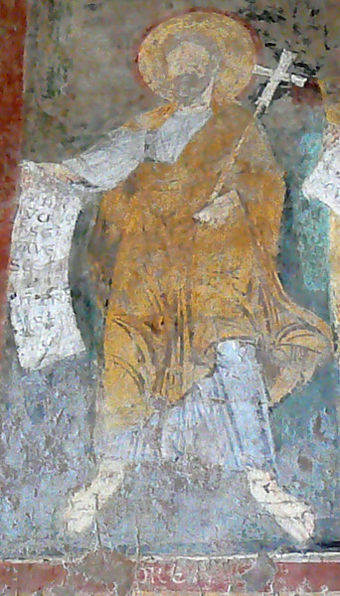 The second illustration is a 5th Century fresco of Andrew at the Basilica of St. Paul Outside the Walls at Rome. Andrew was one of two disciples named in St. John’s account, each of whom had doubts about how Jesus could feed so many with so little. The other disciple who was a skeptic was Philip. 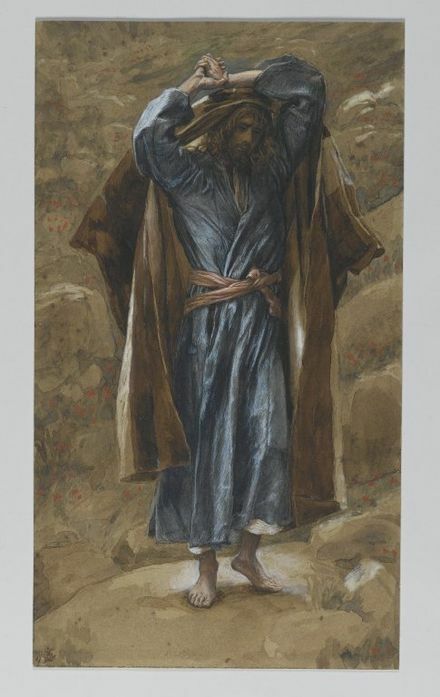 He is represented in this blog post by a late 19th Century opaque watercolor over gray wove paper by the French artist, James Tissot, and which is part of the life of Christ series by Tissot at the Brooklyn Museum, which placed the works in the public domain. Philip could not see how two hundred denari worth of bread could give even a little to over 5,000 people. We should remember that in the 1st Century the counts of such crowds did not include women or children, therefore the number present was quite likely many more than 5,000. I present the Feeding of the 5,000 in the context of the unique material found only in St. John’s version of the event and also the lirugical parallel between how Jesus prepared, presented and distributed the bread and fish to the traditional service of Holy Eucharist (from the Greek, meaning a thanksgiving). Blessings and best wishes to all those who have followed and supported the Internet ministry of the Anglican Internet Church. I hope you will attend your local church/parish this Sunday for the Fourth Sunday in the penitential season of Lent. Another week and another snow storm here in Richmond, leaving behind about 2 inches of sleet, snow and ice glaze on the ground. I fervently hope this is the last one for the season! I’ve got my garden suppliers catalogs on my desk and some plant material already ordered from BrentandBeckysBulbs in Gloucester County, VA.
Just this week I had a client and his wife in for a review meeting and the topics of staying busy and having the time and the combination of physical-mental-technology to make it possible to continue producing videos, books and podcasts. As my wife puts it, it keep me out of trouble. I also published a Podcast Homily for Third Sunday in Lent. I was unable to find a good illlustration of the content of the Gospel reading from St. Luke on Jesus’ expelling of the evil spirit from the mute man. If you know of something, please let me know so I can put it in the library of illustrations for use next year. I did use a 12th Century mosaic in the Byzantine style at the Cathedral in Palermo, Sicily, depicting Jesus’ entry into Jerusalem riding the colt side-saddle in the Eastern and kingly manner. I finished production a limited number of 2-CD sets with all twelve of the movies for Reflections on the Twelve Days of Christmas. You can watch these on You Tube, but if you’d like your own set, pls send a check for $26.00, which includes shipping and handling via USPS Priority Mail. Make checks payable to Anglican Internet Church and send them to 7162 Soft Wind Lane, Mechanicsville, VA. Later I plan to set these up on our web site so that people can use PayPal to place orders (for this collection, for the new Paintings on Light video, and the Great “O” Antiphons series.